The Macina Sport 10 CX5 PT is designed for practical, comfortable riding over a wide variety of terrain. Long gone are the days when electric bikes looked clunky and ugly! 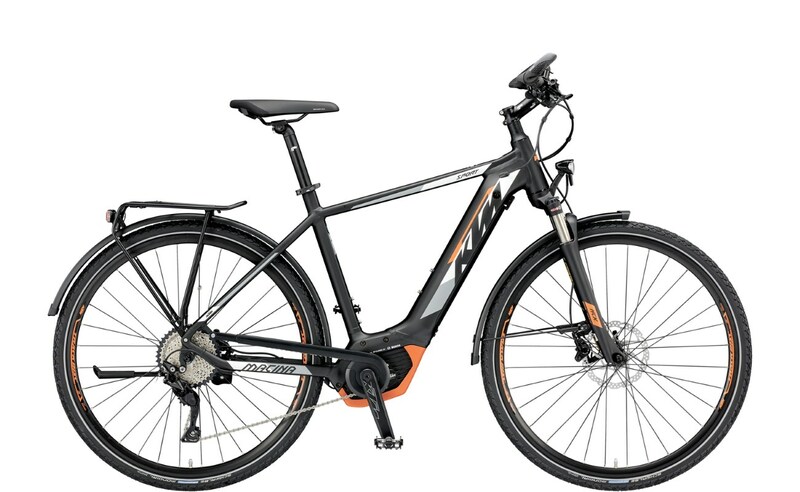 The KTM Macina Sport 10 CX5 has looks to die for! A true sports utility vehicle. Great for commuting, or leisure riding, the Sport 10 CX5 takes in forest trails, canal paths or the less than smooth UK road network with ease. Those climbs, and accelerations away from tricky junctions aren’t a problem as power is delivered by the powerful Bosch CX drive system. Battery capacity is huge. The fully integrated 500Wh Bosch PowerTube ensures extensive range for even the longest journey. The Macina Sport 10 CX5 comes equipped with a fine 10-speed Shimano Deore derailleur with rapid fire shifters. Changing gear is effortless and precise, just when needed. Suspension is via a pair of Suntour NCX-D forks that cope admirably with all those bumps and hollows. The ride is ultra comfortable, yet sporty. Designed with the rigours of day to day use, the Sport bikes come fully equipped. Front and rear mudguards ensure a clean arrival. The rear carrier is capable of carrying more than ample loads. It uses the Racktime Snap-IT system for easy on and off attachment of luggage. Hassle free, with no awkward clips or Velcro requiring fastening. High powered Busch & Müller lights both front and rear enhance safety and visibility. The Intuvia display with walk assist function is mounted unobtrusively, centrally on the bars, providing all rider information. Schwalbe Marathon Mondial tyres set on KTM Line rims ensure a good level of puncture resistance at all times. The addition of a Selle Royal Ariel saddle ensures the Sport 10 CX5 is an extremely comfortable ride. The Sport 10 CX5 is available in crossbar, semi-step and step-through frames, each one having a number of different size options.